1. What is the degree offered by SJMSOM? The degree being is "Master of Business Administration" of Indian Institute of Technology, Bombay. 2. Does SJMSOM apply sectional cut-off? Sectional as well as overall cutoffs have been applied for this year. Details can be found here. 3. Do we have to choose a specialization in second year or is it a general MBA? It is a general management program. You have the option of choosing electives from SJMSOM as well as other departments in IITB based on your interest. 4. What is the faculty: student ratio at SJMSOM? There are 24 "Core Faculty" for about 220 students which work out to a faculty: student ratio of about 1:10. If one includes the visiting faculty, the ratio will be even better. 5. How is the student/faculty exchange program at SJMSOM? SJMSOM has an active "Student exchange program", with some of the universities with which IIT Bombay has an MoU. Efforts are also on to develop a fully functional "Student Exchange Program". We do have faculty exchange program with a few universities (refer website for details); many faculty travel internationally for research. In addition to this, the International Relations team is working towards organizing study tours for select students every year. 6. Is there any Scholarship scheme running for the students of SJMSOM? Yes, there are a few scholarships being offered at SJMSOM. Based on the student’s performance in the semester exams approximately 20% of the students are beneficiary of the various scholarships which come from various endowment funds. Besides, a few other scholarships are available centrally from IIT-B. Also, SC and ST candidates are exempted from paying the tuition fees. 7. Does the college help in getting loan for fees? We have State Bank of India & Canara Bank in our campus. SBI has one Education Loan Scheme exclusively for reputed institutes like SJMSOM & IIT Bombay, named “SBI Scholar Loan”. It’s a pre-approved loan scheme subject to submission of required documents by students. The loan is sanctioned by the campus branch itself. It is a collateral free loan has lower interest rate, interest subsidy during moratorium period whose family income is below 4.50 lacs & no processing fees. The first semester fees paid to the institute is also reimbursable. For more features & details, you can check out this document & visit bank website www.sbi.co.in. Canara bank also offers similar kind of education loan to the students of SJMSOM under the scheme of Vidya Turant. This is also a collateral free loan with lower interest rate & this also comes with interest subsidy scheme for students whose family income is less than 4.5 lacs. Kindly visit bank website www.canarabank.com for further details. Changes if any will be informed through the official mediums. 9. What qualifying degree should a dual degree student write in the application form? You have to select your graduation degree from the drop down provided in the qualifying degree. For example if you are a student of B.Tech+ M.Tech then you should select B.Tech in the qualifying degree and M.tech in the Additional Post-Graduation/ Professional Qualification. 10. What grade should a dual degree student put in undergraduate marks & post-graduate marks? The Candidate should provide the details of their graduation marks as provided by their university in the Graduation degree details and their Post-graduation mark details in the Additional Post-Graduation/ Professional Qualification. 11. I have CPI out of 10 & not percentage as final score. Should I convert my CGPA into percentage & fill in? No. If the original grade card mentions CPI & even if your college/university provides conversion formula between percentage & CPI, you must enter CPI only. 12. Who will handle queries regarding form filling? 13. What is the eligibility criterion for applying? 1. A four year Bachelor’s degree or a Master’s degree in any discipline with first class or 60% marks (55% in case of candidates belonging to SC/ST category) in aggregate (including all years/semesters) or a minimum CPI of 6.5 (6 in case of candidates belonging to SC/ST category) out of 10 , from the universities incorporated by an act of the central or state legislature in India or other educational institutions established by an act of Parliament or declared to be deemed as a University under Section 3 of the UGC Act, 1956, or possess an equivalent qualification recognized by the Ministry of HRD, Government of India. 2. CA/ICWA, with a first-class Bachelor’s Degree in any discipline having secured 60% marks (55% in case of candidates belonging to SC/ST category) in aggregate (including all years/semesters) or a minimum CPI of 6.5 (6 in case of candidates belonging to SC/ST category) out of 10. 3. Applicants appearing for the final year of the degree examination and those who have completed the degree requirements and awaiting results can also apply. The admission in such cases will be subject to their fulfilling the minimum eligibility criteria as stated in (1) or (2), at the time of joining the course. For the purpose of application, international applicant is one who holds a foreign passport, or has Indian passport but is studying/working abroad continuously for more than or equal to two years (as on 30 Sept. 2019). 1] A four year Bachelor’s Degree or a Master’s Degree in any discipline with first class or 60% marks (55% for candidates belonging to SC/ST category) in aggregate (including all years/semesters) or minimum CPI of 6.5 (6 for candidates belonging to SC/ST category) out of 10. 2] CA/ICWA, with a first class Bachelors Degree in any discipline having secured 60% marks (55% for candidates belonging to SC/ST category) in aggregate (including all years/semesters) or minimum CPI of 6.5 (6 for candidates belonging to SC/ST category) out of 10. 3] Those appearing for the final degree examination can also apply. The admission in such cases will be subject to their fulfilling the minimum eligibility criteria as stated in (1) or (2) at the time of joining the course. 14. What was the last year minimum GMAT score for the Shortlisted NRI Candidate? Also are NRI Candidates exempted from attending WAT/PI? There is no minimum GMAT score requirement for NRI/Foreign national. Everyone with a valid GMAT score can apply. Based on the no. of applications, the faculty chooses the best profiles. About WAT/PI: NRI candidates don’t have a WAT but a PI. If the candidate is not in Mumbai then the panel does a telephonic interview or Skype. If the candidate is in Mumbai and can attend the interview in SJMSOM then he/she is asked to do that. 15. How many seats are reserved for sponsored candidates? There will be no seats reserved for sponsored candidates. 16. What are the selection criteria for getting a WAT/PI call? Candidates have to appear for CAT (Common Admission Test) 2018 conducted by IIMs. Complete selection criteria can be found here. 17. How are the cut offs for WAT/PI calls decided? 18. What is the total number of seats for 2019-21 batch? The total number of seats this year is 123. 19. Are calls given based on profile or only based on CAT marks? Please refer to question number 16. 20. When is the WAT/PI process for domestic and international candidates conducted? The WAT/PI will be held from 7th to 10th March 2019 for domestic candidates. The process for international candidates will be done after the process for domestic candidates is completed & will be communicated to the candidates via email. 21. Has the number of seats for general category increased from last year? There has been no change in number of seats for any category. 22. Will my request for re-scheduling of WAT/PI slot entertained? Only under exceptional circumstances and genuine cases, it may be considered. 23. When will the results of WAT/PI be announced? The dates are yet to be decided. All the IITs come out with the results in a span of one or two days. This decision is taken jointly by all IITs at a later stage. It is likely to be announced tentatively in last week of April, 2019. What are differentiators of the SJMSOM? SJMSOM has several elements to support differentiation as a leading management school of India. One major differentiator is high quality faculty with unique areas of expertise. Most faculty are very active in research and regularly sharing knowledge through publications. Such high quality research is perhaps the reason that IIT Bombay, SJMSOM has sustained ranks among the top Management Institutes in India (World University Ranking, 2015, NIRF Ranking 2018). The other elements include greener ecosystem (from knowledge creation to technology to venture creation) of IIT Bombay, one of the top universities of India and amongst the best in the world (IITB, 2015). IITB has sustained leadership for decades. Apart from quality labs, IITB has a growing no. of research centres (e.g. Tata Centre for Technology and Design ) and evolving entrepreneurial ecosystem such as technology business incubator (SINE). Are there any unique offerings at SJMSOM? Please refer to SJMSOM brochure to get feel for a list of unique courses being offered at SJMSOM. What are other differentiators for SJMSOM? Linkages with IITB ecosystem provides an opportunity for a capable and committed learner to evolve a very different profile for her/himself. Opportunities are plenty, and you must see for yourself, if you get opportunity to visit us for next phase of selection. Do take advantage of any offer of ‘Campus Tour’ to get feel for the ecosystem and infrastructure for your mind and body. 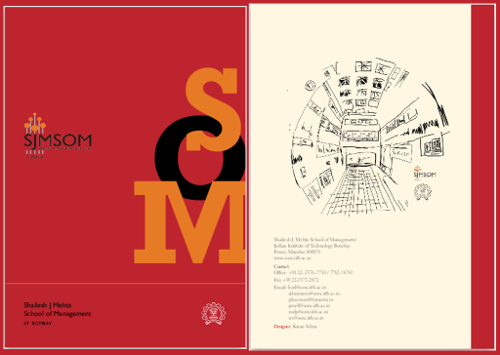 Perhaps, such option of holistic development is a real differentiator of SJMSOM, IITB. Improving levels of energy of SJMSOM batches can be seen in ‘Spike – The Sports Club’ that we launched in 2015. Many of our students train systematically to elevate themselves to levels of biathlon, triathlon, swimathon etc. Some students and alumni build on further and participate in events such as Mumbai Marathon. What are the opportunities for international students? SJMSOM welcomes capable international students. While they benefit from learning and research environment of SJMSOM, IITB, they are expected to contribute to program from their international experiences. What are opportunities to explore research? IITB, SJMSOM provides an ideal environment to explore research. Since, several faculty work on emerging research, capable and committed students can look for opportunities from early stage. Faculty are working on many areas from finance, marketing, management of technology (MoT), operations and OB/HR to emerging areas such as international business (IB) / competitiveness / strategy and innovation.